Quick Overview: This packing is a multi-yarns packing. The corners of packing are made of aramid fiber yarns impregnated with graphite PTFE, the friction faces are made of graphite PTFE yarns. 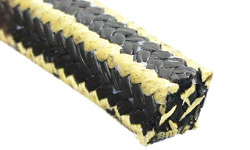 This structure enhances the lubrication ability of aramid fiber and improves the strength of the pure graphite PTFE.